Here's one I've wanted to do for a while - the story of this ship has always interested me. Thanks to Colombamike for providing some excellent source drawings that showed the correct shape of the 5" gun tubs. This is HOUSTON (CA-30) in March of 1942 at the Battle of the Sunda Strait. HOUSTON is camouflaged in a locally-improvised form of Measure 1, with "Cavite Blue" replacing the usual Dark Grey (5-D) applied in US yards. The Asiatic Fleet base at Cavite in the Philippines reported issues with sourcing the required pigments to create the Dark Grey (5-D) formula, so "Cavite Blue" was mixed from on-hand stocks. This was a medium blue between Sea Blue (5-S) and Ocean Grey (5-O). The Cavite Blue paint was not particularly hard-wearing and photos of the HOUSTON show heavy paint-chipping and weathering. The upper works remain the #5 Standard Navy Grey applied to most pre-war USN ships; Measure 1 called for the early form of Light Grey (5-L) but most researchers agree that CA-30 would have only had the old #5 Navy Grey available. HOUSTON shows all of the usual immediate pre-war alterations made to the NORTHAMPTON class ships. 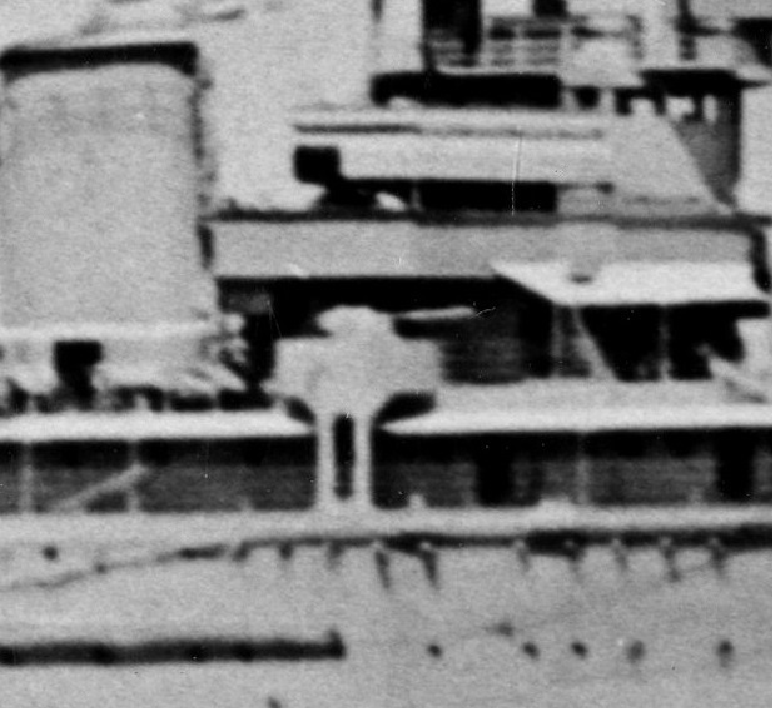 Mark 19 gun directors in recognizable turrets have been fitted atop the pilothouse and above the after main battery direction station. These replaced the original Mark 19 directors, which had separate range/bearing units and altimeters (which resembled a short-base rangefinder). The main top has been removed, likely to clear sky arcs for the .50-caliber machine guns in the "bathtub" atop the mainmast. Mark 24 gun directors control the 8"/55 main battery guns. A Curtiss SOC Seagull of Cruiser Scouting Squadron FOUR (VCS-4) is spotted on the catapult. HOUSTON had light anti-aircraft guns (1.1" quads and 3"/50s) added at Mare Island in 1940 and Cavite in mid-1941. The exact configuration remains unknown, with veteran testimony contradicting official records; the drawing is based on the "best guess" understood by researchers on the Ship Model Forum. HOUSTON was sunk at the Battle of the Sunda Strait, along with the Australian cruiser HMAS PERTH (D29). 368 men went into the water, to be captured by the Japanese and sent to prisoner of war camps. Only 291 survived the war to be repatriated to the USA. AWESOME!!! You definitely did the ship named for our hometown justice! ...And well worth the wait. An iconic drawing representing an iconic ship. What did your research show for the medium AA? 2x3"/50 mounts and 2x1.1"/75 quadruple mounts? Her measure 1 light grey didn't start at the top of the funnels? Impressive research and a great drawing! I'd love to hear more of what you found out. To someone raised on a diet of relatively "compact"-looking US cruisers with stern hangars, these last few projects of yours have scarcely even looked American. More like one of the many weird or dopey British battleship sketches of the G3 era. It's a magnificent rendition, of course. It just looks so open and uncluttered in the after midsection, as if you could trivially add at least another 8/55 turret aft. Thanks all. I am not planning on drawing any pre-war variants of these ships as Bezobrazov has already done them (though the loss of the Dropbox public folder seems to have killed the links to the newest versions). What did your research show for the medium AA? 2x3"/50 mounts and 2x1.1"/75 quadruple mounts? Discussion on the Ship Model Forum states that the 3"/50s were landed at Cavite in late 1941 and replaced with 1.1" quads - meaning the ship (as lost) would have had four 1.1" quad mounts, in the circular tubs fore and aft. Maddeningly few photos of the ship post 1941 exist (they had other things to deal with than taking nice photos). Her measure 1 light grey didn't start at the top of the funnels? Just based on this, it would appear to me that the light grey paint started at the 02 level forward and above the 01 level aft. The funnel caps remain Dull Black (BK). The weathering of the Cavite Blue paint is also very obvious - so who knows if the upper works are actually just faded Cavite Blue?! We will probably never know for sure, and the discussion on ModelWarships hints at this being a decades-long area of confusion. I'm sorry to have "stepped on your toes", so to speak, but I do specifically remember being asked to draw the 'wartime' variants of this class in your thread. I would like to do some of the later refits with radar and massive anti-aircraft armament increases, but I've moved onto something else for now. I'll come back to these later on. edit: After further discussion with one of the researchers on the ModelWarships forum, I've revised the drawing to show the Cavite Blue extending up to the level expected with Measure 1. Apparently the bridge appeared lighter because of extensive fading of the Cavite Blue paint. The searchlights have also been painted dark grey and the camouflage on the mainmast has been modified as well. You did not step on any toes. I merely voiced a longing - a dream or ambition, whatever one may call it. I'd solve a few issues differently (as I've done in my prewar drawings) but to bring those up, I think would be a rather petty thing to do. Overall, your drawing is impressive, as always, and you have my compliments for it!